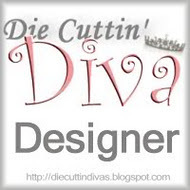 Today I am Guest Designing at Die Cuttin' Divas! This is a first for me, so I'm very excited to share my first Christmas card for this season. Yes, I need to get busy, I know. This week is sketch week at DCD, and this was just the motivation I needed to get started. I'm pleased with how my card turned out. Let me know what you think. And then be sure to visit Die Cuttin' Divas to see what the Design Team has made!! Here's a close-up of the wreath. Don't you just love these intricate cuts?! I cut two wreaths and put foam dots in between to layer them. I really love that look! And here's the inside of the card which I wanted to match the front, so I bordered the edges with the patterned paper. Red holly patterned paper is from my stash, cut at 5-1/2" to cover the front. White cardstock is cut at 4-3/4" square and embossed with a Sizzix folder called Snow Globe (for some reason); it's holly and berries design as I hope you can see in my photos. Merry Christmas paper from my stash for the green mat which I punched with a Fiskars scalloped border punch, and inked the edges. The wreath is cut from Trim the Tree seasonal cartridge at 2-3/4". This cartridge is very, very intricate and cuts best at larger sizes. But even at this small size, it cut pretty well. I used adhesive backed cardstock which made it much easier to apply to the underneath layer of red shimmer paper (DCWV). The banner tags are cut from one 4x6 piece of patterned paper from the DCWV Christmas Combo matstack and inked with Jim Holtz Antique Linen distress ink. Deck the Halls was $1.00 sentiment from Joann's that I picked up last year. I'm going to also share this card at You Had Me at Craft link up party. Thanks for stopping by my blog! I appreciate all your comments! -- Pat N.
Beautiful Pat.Congrats on being a guest designer of our blog. Very pretty Pat! Great pattern papers! Congrats on GD! Hey Pat, congrats on being a guest designer! I saw the sketch over there and you did a fabulous job with it! Very nice card great colors. Congrats on the Guest designer spot. the card is lovely. Hi again I happen to come by looking, so I thought I would just say HI. Very pretty card. Love how you used the pop dots to layer. This card is absolutely beautiful. You are giving me inspiration.